PomoNews.com: ASSANGE: "CLINTON AND ISIS FUNDED BY THE SAME MONEY"
What connects President Obama and the former Secretary of State Hillary Clinton to the wars in the Middle East and North Africa and explains Western warmongering against Russia? A personal vendetta of Clinton with Gaddafi led to destablization, thousands of deaths and the international migrant crisis. UPDATE: In the second excerpt from the John Pilger Special, to be exclusively broadcast by RT on Saturday, courtesy of Dartmouth Films, Julian Assange accuses Hillary Clinton of misleading Americans about the true scope of Islamic State’s support from Washington’s Middle East allies. In a 2014 email made public by Assange’s WikiLeaks last month, Hillary Clinton, who had served as secretary of state until the year before, urges John Podesta, then an advisor to Barack Obama, to “bring pressure” on Qatar and Saudi Arabia, “which are providing clandestine financial and logistic support to ISIL [Islamic State, IS, ISIS] and other radical Sunni groups.” “I think this is the most significant email in the whole collection,” Assange, whose whistleblowing site released three tranches of Clinton-related emails over the past year, told Pilger in an exclusive interview, courtesy of Dartmouth Films. Part 1 RT: Pilger interview with Julian Assange. ‘Russia not behind Clinton leaks’. There's another side to the war in Syria that is of strategic importance: at stake are the economic future of the region and its natural resources. Gas as an aspect of the war in Syria is very much underexposed. Actually it's about a pipeline that is of vital interest to Europe and Qatar. It's a game of chess on a global stage. Syria is the battle field in the fight over the hegemony of the Islamic Middle East between Sunni and Shia Islam. And who is the paymaster? In 2013 the Gulf's gas giant, Qatar spent 3 billion dollars arming the so called rebels. The emirate is the biggest donor in the war and is paying defectors enormous amounts of money. Qatar is sitting on a gargantuan natural gas deposit, the third largest in the world. The intervention in Syria is an aggressive bid for the recognition of its dominant role in the region. First they conspired with Obama and Clinton to overthrow Ghadaffi, then the tribes of Mali were encouraged to Jihad. But that's not all. 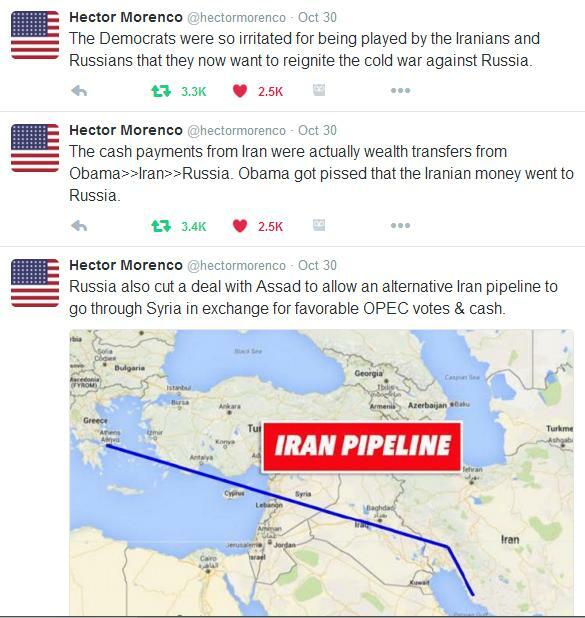 Read it all in Gas Plays an Explosive Role in the War in Syria.
.@hectormorenco Can confirm the facts about pipeline and State triggering Arab Spring. Have been blogging about that at the time. Gaddafi agreed to hold free elections, but Hillary Clinton personally nixed a peace deal with Libya that would have prevented the country being seized by ISIS, all because of a personal vendetta with Gaddafi. It led to the destablization of northern Africa, thousands of deaths and the international migrant crisis. Aug 26, 2016 Assange: Clinton’s involvement in Libya is the “most interesting and serious” information on Hillary to date. In late August WikiLeaks founder Julian Assange joined Fox and Friends to discuss the leaked Hillary Clinton emails. 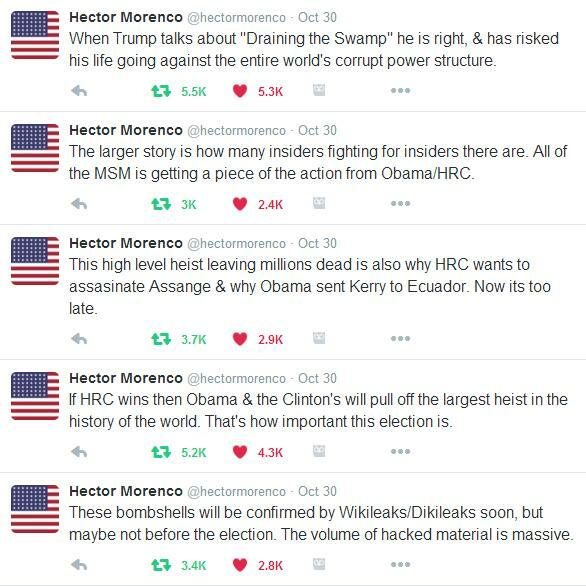 Assange said the “most interesting and serious” information on Hillary Clinton is yet to be released. However, when pressed as to what is the most damaging email to date, Assange noted a stream of emails related to Hillary Clinton’s involvement in Libya. Assange stated that 1,700 emails were released related to Hillary’s involvement in Libya but perhaps none more damaging than the ‘Libya Tick Tock’ email (source) or Hillary’s “internal brag sheet of how she was the person behind the Libyan catastrophe”. 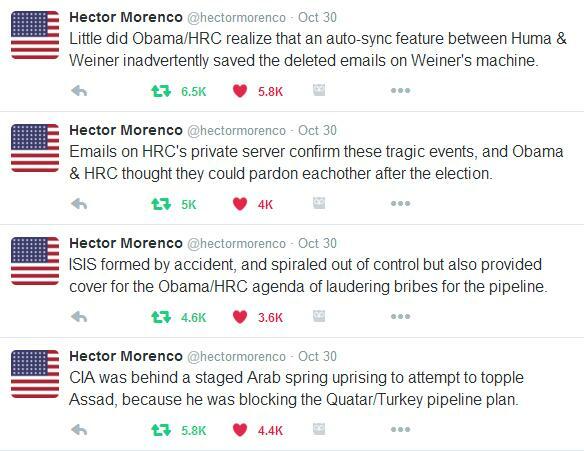 and lastly, Hillary’s State Department worked to construct a $1.5 billion assets package to the TNC. The Clinton State Department took credit for being the architect behind the overthrow of Qadhafi in Libya and the subsequent horror as a result. But there was a problem. Secretary of State Hillary Clinton didn’t want peace. As a result the war went on and Hillary’s actions in Libya resulted in the eventual death of four Americans in Benghazi, including Chris Stevens. These Americans died due to Hillary’s and Obama’s inaction when they called for help when under attack in 2012 as was famously portrayed in the movie 13 Hours. Clinton is also responsible for the thousands of violent Libyan deaths since her efforts to over throw Qadhafi. She is also responsible for the numerous atrocities in Libya over the past eight years. Today Libya is a quagmire and ISIS’s strongest branch outside of Syria-Iraq. Hillary had a chance for peace but instead gave Libya to ISIS! Later sick Hillary joked about Qadhafi’s death in Libya. Jun 17, 2016 Hillary Clinton: We need more love and kindness - we came we saw he died. Gaddafi agreed to hold free elections, but Clinton's refusal led to ISIS takeover, thousands of deaths, and the international migrant crisis. Hillary Clinton personally nixed a peace deal in Libya that would have led to free elections and prevented the country being seized by ISIS, all because of a personal vendetta she had with Muammar Gaddafi, according to explosive new claims made by a whistleblower who personally oversaw the negotiations. Christian preacher Dr. Kilari Anand Paul is a global peace ambassador originally from India who is now a naturalized U.S. citizen. Colonel Gaddafi personally invited Dr. Paul to Tripoli, Libya for peace talks having looked up to Paul as a spiritual leader since 1992 and having been impressed with the evangelist’s counseling work with King Hussein of Jordan and Yasser Arafat. According to Dr. Paul. General Clark was so pleased with the outcome of the negotiations that he personally arranged a teleconference with Hillary Clinton on the line to congratulate Dr. Paul on “getting the job done in the face of such danger.” But there was a problem. Secretary of State Hillary Clinton didn’t want peace. She wanted Muammar Gaddafi dead for her own selfish, spiteful reason – the fact that Gaddafi had favored Barack Obama over her own campaign during the 2008 presidential election cycle. “It’s well known in Libya that Gaddafi supported Obama over Clinton in the run up to the ‘08 elections, despite the Clinton team approaching Gaddafi’s son, Saif al-Gaddafi, and asking the family to invest in Hillary’s campaign and foundation, which they did not,” said Dr. Paul. “Her personal vendetta better explains her oddly giddy behavior when taking credit for Gaddafi’s horrifying death, as captured on video for the world to see,” asserts Dr. Paul, adding that the footage “is evidence of a pathology or mental illness.” Libya subsequently fell to jihadist rebels allied with Al-Qaeda, militants who had killed U.S. troops in Iraq and went on to kill four Americans during the Benghazi siege – all because Clinton had a personal vendetta with Gaddafi over his support for Barack Obama. It is important for the reader to understand that the Clinton-mouthpiece mainstream media will try to discredit this report by attacking Dr. Paul’s credibility. However, Dr. Paul’s account is backed up by former Congressman and civil rights leader Walter E. Fauntroy, who also visited Libya on a peace mission and was subsequently holed up with journalists at the Rixos Al Nasr hotel. During his time in Libya, Fauntroy claimed that he witnessed Danish and French special forces committing atrocities against Libyan civilians and rebel fighters to be blamed on the Libyan government. After the war, Fauntroy disappeared for five years, reportedly over allegations he had written a fraudulent check for $55,000, although the Congressman says he fled because he feared he would be assassinated to prevent him revealing what he had witnessed in Libya. New York Times bestselling author Jerome Corsi vouched for Fauntroy’s credibility. Corsi is set to release new footage of atrocities committed by Libyan rebels that were backed by Hillary Clinton. “I have spoken with former Congressman Walter Fauntroy and I have researched his account of his experiences in Libya,” Corsi told Infowars. “My conclusion is that Fauntroy is 100 percent credible and telling the truth. He confirms what I have already put into print about various other efforts to have Gaddafi abdicate that were ignored or otherwise rebuffed by the Clinton State Department.” Dr. Paul’s claims are consistent with reports that Clinton refused to take a Skype call from Moammar Qaddafi’s son Saif, who was also trying to broker a peace deal. Dr. Paul is vehement in laying the blame for the subsequent disaster in Libya firmly at the feet of Hillary Clinton, adding that the entire scandal “makes Watergate look like child’s play.” “The image of bodies of women and precious children piled high in the streets of Tripoli will haunt me forever—not to mention the millions of others who lost their homes and lives, becoming part of the massive wave of displaced immigrants seeking asylum,” said Paul. Dr. Paul personally endorsed Donald Trump back in February, although he is bipartisan, having supported Barack Obama back in 2008 over his opposition to the Iraq war. Dr. Paul concludes that he is putting his life at risk by revealing Hillary’s role in nixing the Libyan peace deal, but that he can no longer hold back. To help you further connect the dots, the following elements are all related.